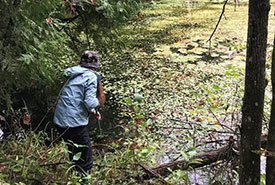 Last summer I spent a lot of time trekking through beautiful wetlands, both while working at NCC and for leisure. I loved every moment of my time there, whether I was wading out into knee-deep water to hand pull invasive European frog-bit, counting frogs, searching for evidence of turtle nesting or just exploring marshes grown in with cattails twice my height. 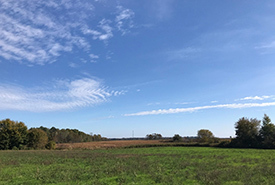 Much of this field work was spent at the Brighton Wetland, a newly acquired property that is co-owned by the Nature Conservancy of Canada (NCC) and Ducks Unlimited Canada. This special place is 231 acres (93 hectares) of lush coastal wetland, including marsh, swamp and field, which is home to many interesting plant and animal species. Over the summer, I saw countless osprey flying over the property, and on many occasions, bald eagles soared over the swamps where eastern wood-pewee shouted their very distinctive “pee-a-wee” calls. While exploring the 2.5 kilometres of Lake Ontario shoreline by boat, painted turtles poked their heads up to glimpse the sunshine, and several beautiful great egrets and great blue herons stood attentively watching our every move. On a rather blustery day toward the end of October, I ventured back out to the Brighton Wetland, and it was a very different place. The grey sky met a rough and wavy Lake Ontario on the horizon. The shoreline, which in the summer had been bustling with ducks, geese and swans, was still and silent. 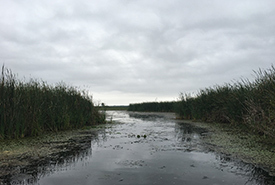 The cattail marshes where frogs call at a deafening level in summer, were ominous and quiet. A look to the sky showed nothing except the occasional chickadee flitting from tree to tree. A wetland that was once alive and booming was now quiet. So, where did everything go? Most wetland plants live for multiple years. This is the case for plants like cattails, which turn brown and fall over in the fall, but have roots that remain dormant under the water. Once conditions improve in the spring, the plant re-establishes itself and grows once again. If you live near a wetland it is very important to leave this fallen vegetation in place, as it provides a place of refuge, insulation and protection for other species. On the other hand, some free-floating plants, like duckweed, or some annuals, might actually die. Their seeds and buds, however, overwinter at the bottom of the wetland, and then new plants grow again in the spring. Unlike plants, which are restricted to the wetlands where they grow, birds can fly around freely. The ability to fly means that birds can relocate when conditions are not ideal. Migration begins as early as June in northern parts of Canada, but most often occurs toward the end of summer and early fall in the rest of the country. Migration for Brighton Wetland species include the threatened least bittern, which travels to the southern U.S. and Mexico. The endangered king rail travels to larger marshes to feed in the U.S. Some readers may note that they have seen ducks and geese in wetlands over the winter. This is not uncommon, particularly in areas where the water remains open and the food supply is good. Unlike birds, frogs migrating to warmer weather would be too difficult, since they would have to hop or swim the entire way. 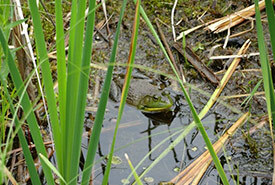 Depending on the species, frogs overwinter in wetlands in a few surprising ways. Largely aquatic frog species (such as green frog and bullfrog) that spend most of their time in the water, overwinter in the water as well. When the standing water at the top of a wetland or pond freezes over, the frogs head to the bottom of the wetland, where the temperature is much warmer than the air (usually around 4 C). There, they remain relatively inactive and spend the winter waiting for spring to arrive. American toads actually bury themselves underground on land for the winter, digging deep below the leaf litter layer and into the soil. Here they stay warm enough and safe from predators and remain inactive until warmer weather arrives. Finally, some frogs literally freeze solid for the winter! 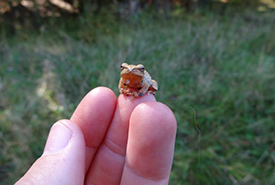 For species like spring peepers and wood frogs, once the temperature reaches a threshold level of roughly 0 C and ice crystals begin to form on their skin, their livers rapidly start taking stored sugars and converting them to glucose. The sugar is then carried through their bloodstream, which prevents the cells from drying. Soon after, the frog’s heart stops beating, and it remains lifeless in the leaf litter, in what I once heard described as the human equivalent to a diabetic coma. As the temperature warms, its heart begins to beat again, and the frog is good as new! As humans, we have pretty boring ways of staying warm for the winter months. We put on heavy clothing, light fires and sit inside heated, insulated buildings. Sometimes we even get on an airplane and fly to warm places. Wetland species do not have this luxury. Instead, they have a wide variety of adaptations to deal with the colder months. So even though wetlands look less spectacular in the winter, it’s a great time to take a second to reflect and appreciate the diversity of life in these habitats as we await the magic that the spring thaw will bring! The Brighton Wetland is a joint Nature Conservancy of Canada and Ducks Unlimited Canada project that was generously supported by funding from the Government of Canada, through the Natural Areas Conservation Program. Amanda Tracey recently finished a PhD at Queen’s University where she completed 10 field seasons at the Queen’s University Biological Station. She recently joined the Nature Conservancy of Canada team as the coordinator of conservation biology for Central Ontario East. Read more about Amanda Tracey.